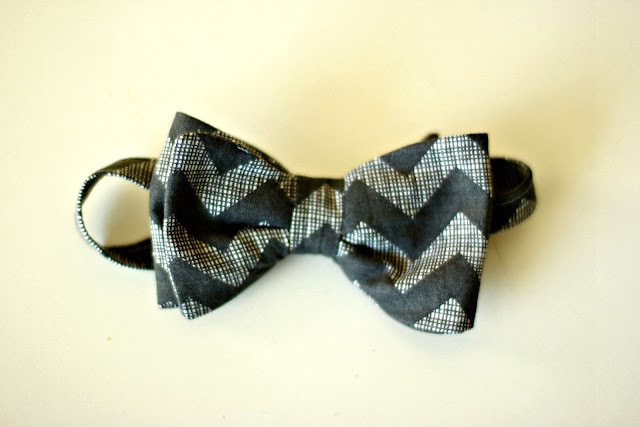 The fact that I love a good Little Man bow tie is absolutely no secret. You can pretty much guarantee that on any given Sunday at least one of my boys will be quite dapperly (totally a word) be sporting a bow tie. I just can't get enough of of them. Kind of obsessed. 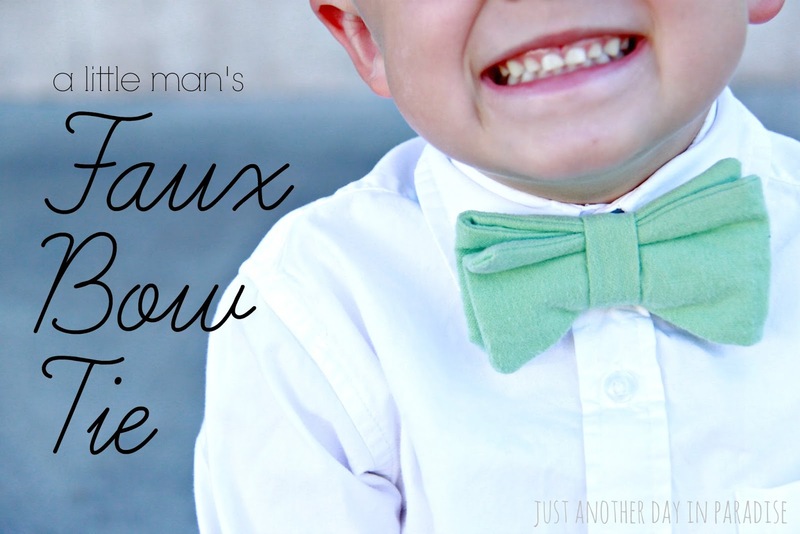 If Hubby would only allow me to put him in one, my bow tie dream world would be complete. Goosh! For several years my boys sported the Dapper Little Man Bow Tie. 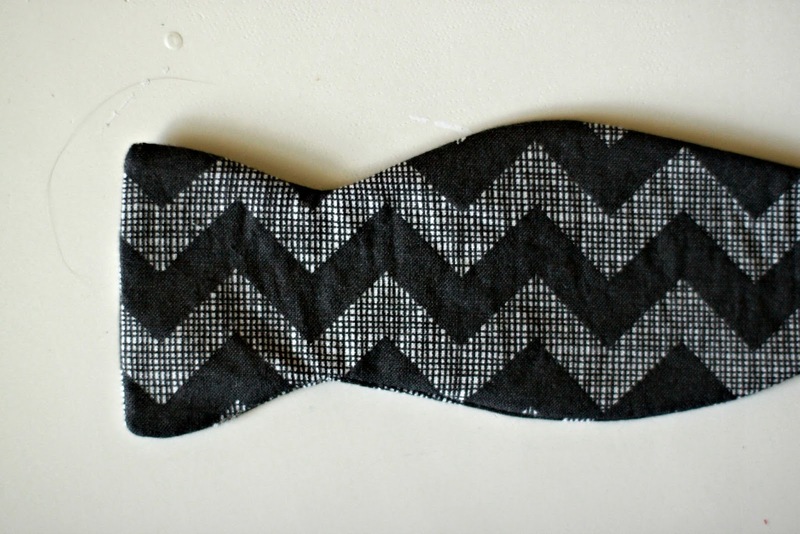 That was the first bow tie pattern I made. I love it and I love that it is tied like a grown up man bow tie, but that it ties easier because of a bit of elastic. Plus it made me feel pretty legit to learn how to tie a bow tie. 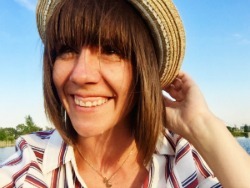 So if I love it so much, why change it up? Why fix what isn't broken. Since, like I said earlier I really rather enjoy a gentlemanly bow tie on my Little Men, and that includes the little wiggly ones too, I had to come up with another solution. Hence the birth of the A Little Man's Faux Bow Tie. When I was coming up with this pattern, I really wanted the bow tie part to look like it would if I had tied it by hand. You know get the same look with WAY less tying effort. I am so happy with the end result. I have actually had this pattern in my arsenal for several months. I most recently made one for Little for our family photo session. Whilst (yes I just got fancy) I was making it I realized I should share with you guys how to make one. 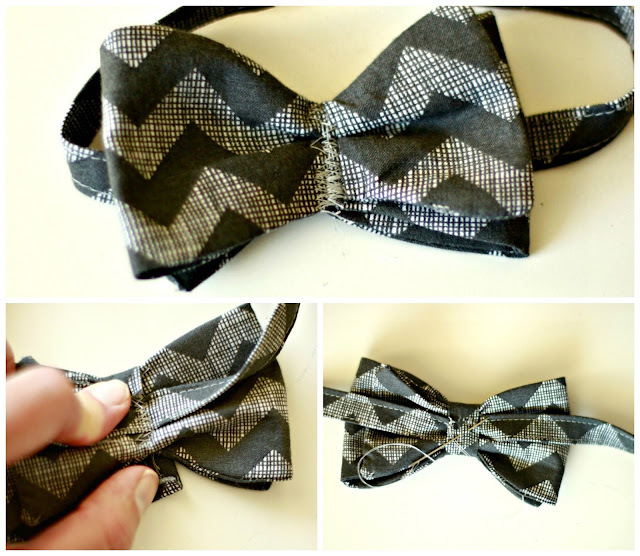 So I whipped up a little tutorial showing you how to make A Little Man's Faux Bow Tie. 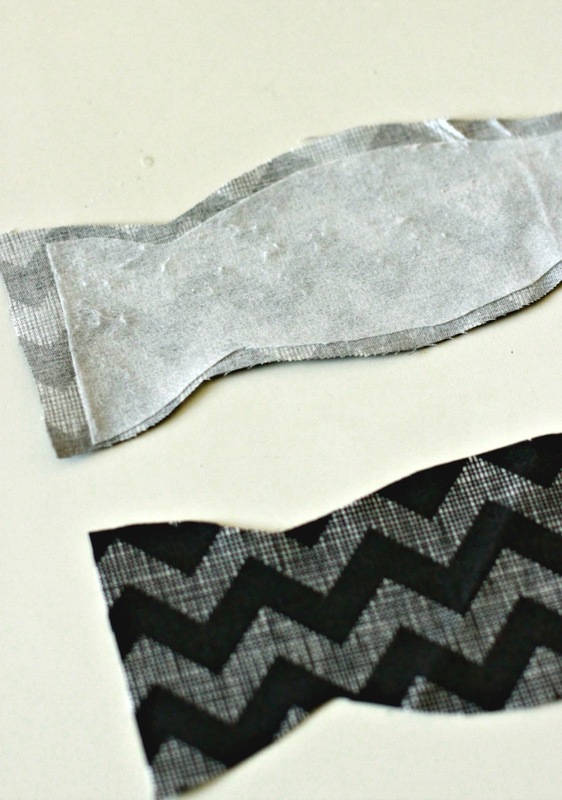 Iron the interfacing piece to the wrong side of one of the bow tie pieces. Pin the bow tie pieces together, right sides facing. Start at one of the flat edges, sew all the way around the edge with 1/4" seam allowance but leaving the edge where you started open. Turn out the bow tie and iron. Iron the raw edge of the open end in. Then hand sew the opening closed. This is the only tricky part, I promise. 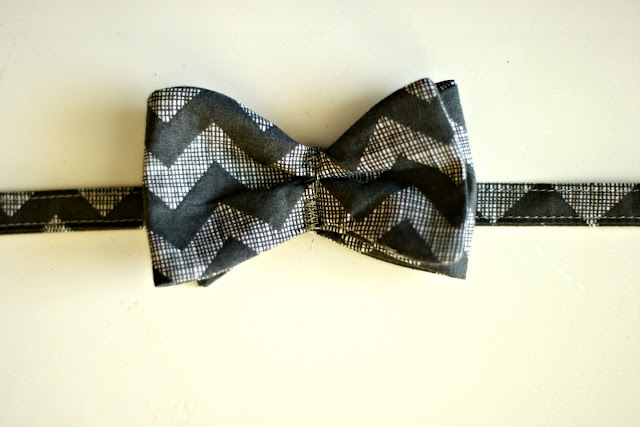 Lay the bow tie out flat. 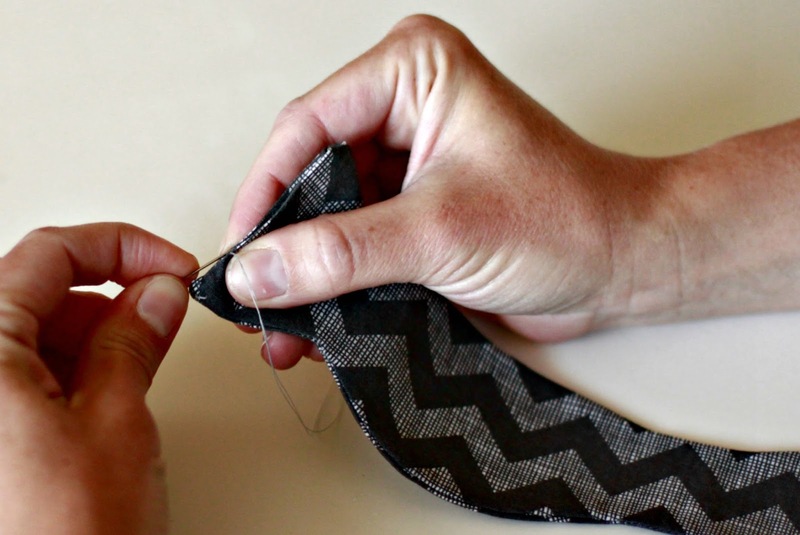 Start at the left side and fold over towards the right so that you make a bow loop on the left side. 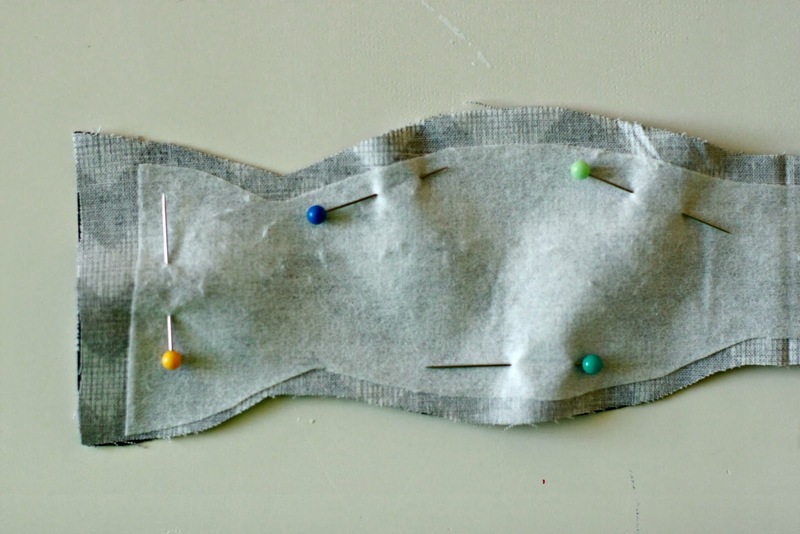 Then fold the bow tie piece back over to the left making a loop on the right side. It should start looking like a bow tie without the knot. Pinch the middle in slightly so it looks gathered. Then secure the bow tie in place by using a zig zag stitch. 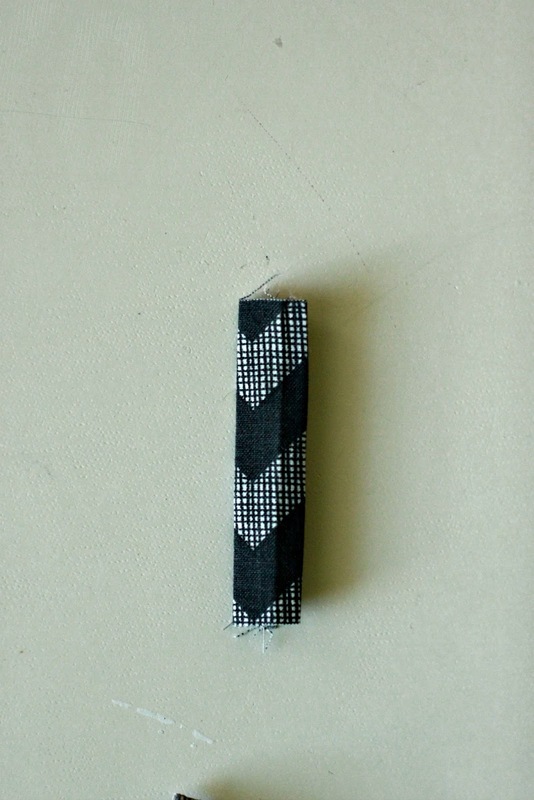 Next sew the neck piece by ironing the long strip in half (lengthwise) and then iron the edges into the middle crease. Iron the whole thing in half. Sew all around the perimeter to secure. 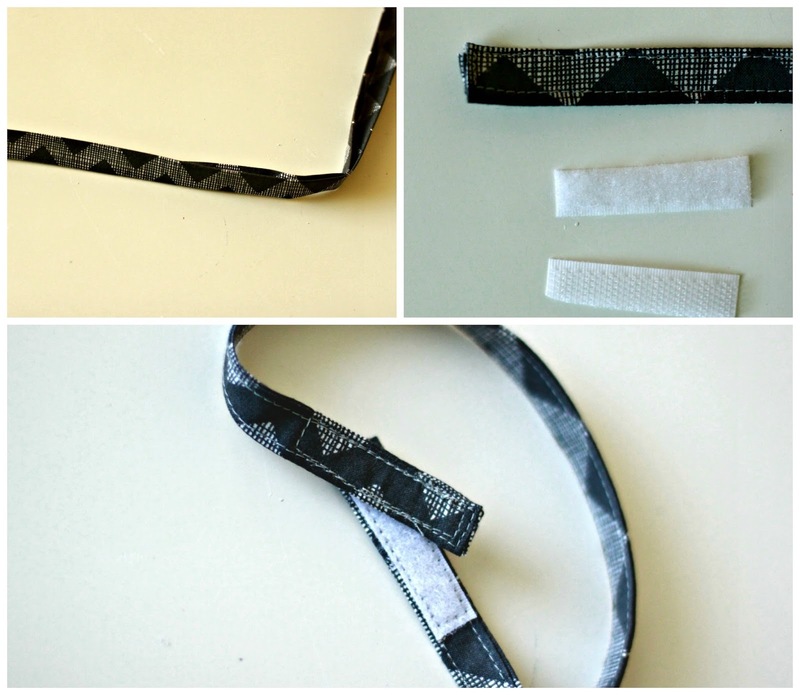 Cut a 2" piece of velcro and then cut it to fit the newly made neck band. Lay out the band flat on the table. Sew one velcro piece to the left end that is facing up. Sew the other piece on the opposite end on the side facing down towards the table. 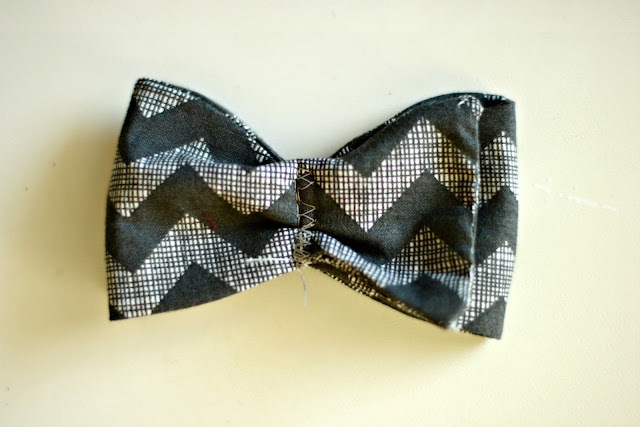 Next, sew the bow tie to the neck piece. Place the bow tie over the neck piece in the middle. Sew the tie to the neck piece. Now for the knot piece. Take the knot piece and iron it in half, wrong sides facing. 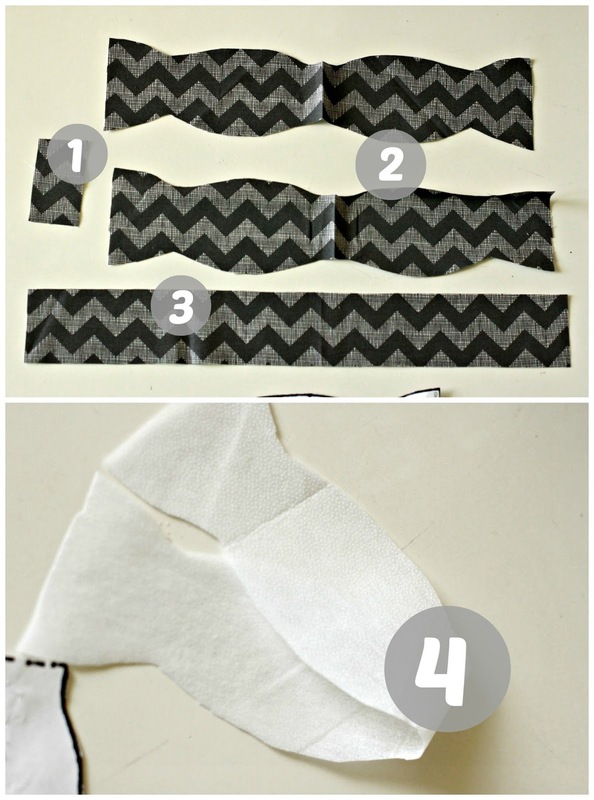 Sew the with a 1/4" seam allowance on the raw edge. Then move that seam to the back and iron the piece flat so that that seam is in the back. Take the newly ironed neck piece and wrap it around the bow tie now attached to the neck piece. Fold over the edge that will show. Sew the knot piece together and in place by hand. 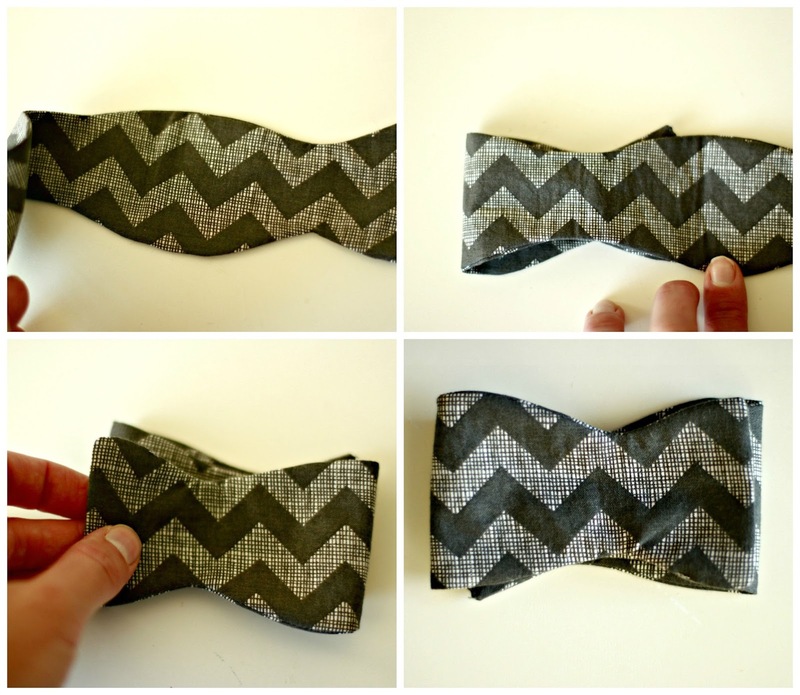 Now you have a simply dapper Faux Bow Tie. Ready for any little gentleman to wear to what ever fancy function strikes his fancy. I hope you have as much fun making little bow ties as I do. I would love for you to pin or share on facebook. Glad you're back! Figured you were just getting your little army ready for back to school. Cute bow tie, does your little Bean try to take it off? That's my battle with my 22 month old Mr. T. He's a master of undoing any accessory. Corrie, Mister Bean does not attempt to take it off...I think he has probably just succumbed to my crazy by now. Poor dude! 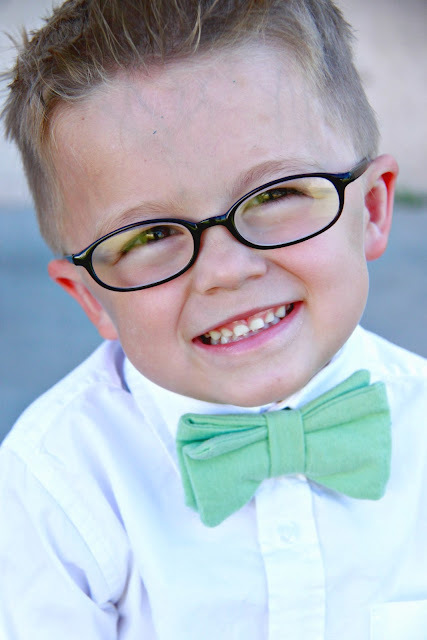 Nothing cuter than a bowtie on a little guy! Awww!